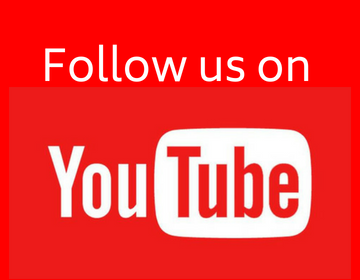 Area: The amount of space occupied by an object two dimensionally is termed as its area. For the given figure, red coloured portion shows area for different objects. Perimeter: The distance around the boundary of the figure is termed as its perimeter. For the given figure, the boundary of the square will be its perimeter. Example 1: Find the area of square whose side is 50m. Given, side = 50 m.
then, area of square = (50)2 = 2500 m2. 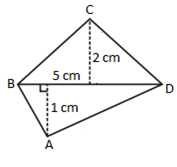 Example 2: Find the perimeter of a triangle with two sides of 15 cm and one side of 20 cm. = (15 + 15 + 20) = 50 cm. Example 3: A flooring tile has the shape of a parallelogram whose base is 24 cm and the corresponding height is 10 cm. How many such tiles are required to cover a floor of area 1080 m2? (If required you can split the tiles in whatever way you want to fill up the corners). Solution: Given, base = 24 cm, height = 10 cm. = 24 x 10 = 240 cm2. Now, we know that 1 m = 100 cm. Therefore, 1080 m2 = 1080 x 100 x 100 cm2. = (1080 x 100 x 100)/(240) = 45000. Thus, 45000 tiles will be required to cover a floor of area 1080 m2 using a tile of 240 cm2. Example 4: An ant is moving around a few food pieces of different shapes scattered on the floor. For which food-piece would the ant have to take a longer round? Remember, circumference of a circle can be obtained by using the expression c = 2πr, where r is the radius of the circle. Solution: For the given problem, the figure for which the perimeter will be maximum will be the one for which ant will take longer round. So, let us find the perimeter for each figure. (a) From the figure, diameter = 2.8 cm. Therefore, radius = 2.8 / 2 = 1.4 cm. Now, perimeter of semi-circle is π r = π x 1.4 cm = 4.4 cm. We can see that the perimeter for figure (b) is largest amongst all, hence, ant will take longer round to travel for (b) in comparison with the other two. Now we will learn about surface area and volume of solids such as cube, cuboid and cylinder. In general, area of trapezium = height x (sum of parallel sides)/2. Example 1: Calculate the area for the following given trapezium. Area of trapezium = 4 x (5 + 10)/2 = 30 cm2. Example 2: The area of a trapezium is 20 cm2 and the length of one of the parallel sides is 8 cm and its height is 2 cm. Find the length of the other parallel side. Solution: Given, area = 20 cm, length of one side = a = 8 cm, height = 2 cm. On solving, b = 12 cm. Thus, the length of other parallel side for the given trapezium is 12 cm. Any quadrilateral can be divided into two triangles by drawing one of the diagonals. Then applying and calculating area of triangle formula on individual triangles, we obtain the area of quadrilateral. Consider the quadrilateral ABCD as shown above. On drawing diagonal AC, we have two triangles ABC and ACD. Example 1: Find the area of some quadrilateral whose diagonal length is 8 cm. And the lengths of two perpendiculars on given diagonal from the vertices are 4 cm and 3 cm. Solution: Here, d = 8 cm. Let the length of two perpendiculars be h1 = 4 cm and h2 = 3 cm. = 1/2 x 8 x (4 + 3) = 28 cm2. Example 2: Find the area of quadrilateral ABCD as shown in figure below. Solution: Given, d = 5 cm, h1 = 2cm, h2 = 1 cm. In general, area of rhombus is half the product of its diagonals. Example: Find the area of a rhombus in which the length of its two diagonals is 4cm and 6cm. = 1/2 x 4 x 6 = 12 cm2. For any polygon, try to divide the polygon into possible number of triangles, quadrilaterals, trapeziums, rhombus, etc. and then find area of each of them. At last, add all the calculated individual area which will give the area of polygon. For example: Consider the polygon ABCDE given in the figure below. Now, we draw a diagonal AD and two perpendiculars BF and CG on it. Thus, we divide the polygon ABCDE into four parts. Finally, area of ABCDE = area of ΔAFB + area of trapezium BCGF + area of ΔCDG + area of ΔADE. = 2 x (10 + 3)/2 = 13 cm2. = 10 x 3 = 30 cm2. = 2 x 13 + 30 = 56 cm2. The three dimensional objects having width, depth and height are known as solid shapes. Example: Cube, cuboid, cylinder, etc. A cuboid is made of six parts out of which four parts are same and remaining two parts are same. From figure, we can write surface area of cuboid as sum of area of six individual parts. Example 1: Find total surface area of cuboid having length, breadth and height as 10cm, 5cm and 2cm, respectively. = 2 (10x5 + 5x2 + 2x10) = 160 cm2. Example 2: The internal measures of a cuboidal room are 20 m × 10 m × 6 m. Find the total cost of whitewashing all walls of a room including ceiling, if the cost of white washing is Rs 10 per m2 . Solution: Given, length = 20m, breadth = 10m, h = 6 m.
= 2 (20 x 10 + 10 x 6 + 6 x 20) = 760 m2. Hence, total cost of white washing entire room = 760 x 10 = 7600 Rs. A cube is made of six equal parts. We know that area of square = (side) 2. In cube, there are six equal square sides. Thus, area of cube = 6 x a2; where a is the length of any side. Example 1: Find total surface area of cube having its one length as 2cm. = 6 x 22 = 24 cm2. Example 2: Find the side of a cube whose surface area is 864 cm2. Solution: Given, surface area of cube = 864 cm2. Let ‘a’ be the length of the cube. Thus, a = 12 cm. 3. 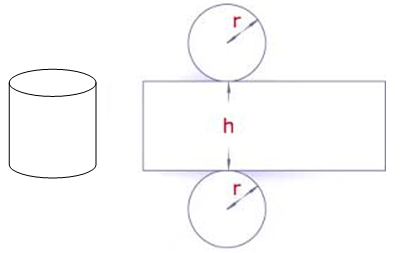 Surface area of Cylinder: From the above figure, we can see that cylinder is made of two equal circles and a rectangle in circular form. = 2 x π x 7 (7 + 4) = 484 cm2. 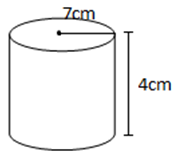 Example 2: Find the height of a cylinder whose radius is 7 cm and the total surface area is 968 cm2 . Solution: Given, r = 7cm, area = 968 cm2. On solving, h = 15 cm. 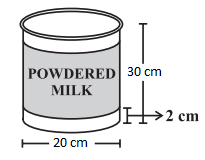 Example 3: A company packages its milk powder in cylindrical container whose base has a diameter of 20 cm and height 30 cm. Company places a label around the surface of the container (as shown in the figure). If the label is placed 2 cm from top and bottom, what is the area of the label? Solution: Here, the height of label will be (30-4) = 26 cm. And the radius of the label will be 20/10 = 10 cm. = 2 x π x 10 x 26 = 1634.28 cm2. The amount of space occupied by an object three dimensionally is termed as its volume. 1. 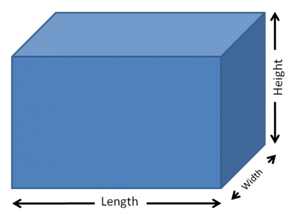 Volume of Cuboid: The volume of cuboid = length x width/breadth x height = lbh. Example 1: Find volume of cuboid having length, breadth and height as 10cm, 5cm and 2cm, respectively. Solution: Here, l = 5cm, b = 7cm, h = 2cm (Given). = 5 x 7 x 2 = 70 cm3. Example 2: A godown is in the form of a cuboid of measures 50 m × 40 m × 30 m. How many cuboidal boxes can be stored in it if the volume of one box is 10 m3? 2. 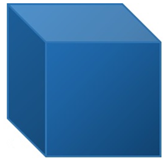 Volume of Cube: In cube, all the sides are equal. So, the volume of cube = length x length x length = l3. Example 1: Find volume of cube having its one length as 5cm. = 53 = 125 cm3. Example 2: If each edge of a cube is doubled, then how many times will its volume increase? Solution: Let the length of cube be ‘l’. Thus, double length will be 2l. For length l, volume of cube = l3. For length 2l, volume of cube = (2l)3 = 8l3. Thus, on doubling the length of cube, its volume will increase by 8 times. 3. Volume of Cylinder: The volume of cylinder = πr2h. Example 1: Find the volume of cylinder having height of 10cm and radius of 4cm. = π x (4)2 x 10 = 503 cm3. Example 2: A rectangular piece of paper 10 cm × 5 cm is folded without overlapping to make a cylinder of height 5 cm. Find the volume of the cylinder. Solution: Here, the length of the paper will become the perimeter of the base of the cylinder and width becomes height. = π x 1.6 x 1.6 x 5 = 40.23 cm3. (a) Volume – it refers to the amount of space occupied by an object. (b) Capacity – it refers to the quantity that an object holds. Thus, 1 m3 = 1000000 cm3 = 1000 L.
Thanx for notes but where is lateral surface area? Thank you so much for the notes. Can't describe how much it helps.